Many of my posts talk about being grateful and expressing gratitude for all of the things that you have in life. As a matter-of-fact, I have one article, healthywealthytribe.com/what-are-you-grateful-for, that is specifically written around this topic. Well, what better time to tackle gratitude again than on Thanksgiving Day? Thanksgiving is a national holiday that was originally celebrated as a day of giving thanks for the blessing of the harvest. In the United States, it is celebrated on the fourth Thursday of November. More recently it is known as the holiday where you stuff your face with turkey (among other fatty foods) and watch football all day. I prefer to remember that it was (and is) a time to express thanks for EVERYTHING in our lives. Many of us (me included) often feel worried about family events that will end with fighting and misery… Unfortunately, there are frequently practical brawls when we get estranged family members together. It is imperative that we find the good in our family and friends during these special holidays. Put your disagreements aside and love one another! You only have to do it once a year, people! If you are one of the lucky ones who doesn’t have any problems with family during these times than consider yourself lucky and disregard this paragraph… HA! Regardless of what you believe or think, the name sums up this most excellent holiday. Thanksgiving is easily rearranged to “giving thanks.” If you dig, use this time to meditate briefly and concentrate on what’s important to you. Think about all of the fortunate things you have in your life. And, share your feelings and gratitude with those closest to you. Enjoy yourself! Eat lots of food! And, most of all… Tell your friends and family that you are thankful for having them in your life! I’m also thankful for you! Vaughn is a happily married daddy, author, and CIO. 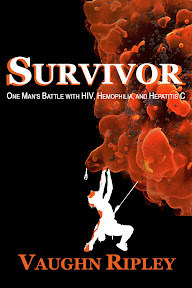 He is an HIV+ hemophiliac, and is one of the longest surviving HIV+ people in the universe. Grateful for all family, friends distant and near (yes, animals are included). Grateful for my age because without the year’s of happiness, trauma, chaos, and peace, I continue to grow both mentally and physically (thanks Weight Watchers hee hee). Grateful for each day! Grateful that my kids love me so much (even when it means it’s me they demand to see when they wake up way too early in the morning). I cherish these times (especially since I get first dibs on the coffee). V – thankful for you too. A continuous source of perspective and role model in many ways for (most of) the years I’ve known you (paintball days aside). Kids are amazing! Thanks for the kind words, brother. I do need to tell the paintball story in a blog article one day… HA! I have so much for which to be thankful, words just don’t come close to being able to portray how I feel. I’m thankful for the fantastic family in which I was raised – my grandparents, parents, aunts, uncles, brother, sister, and all my cousins; for my five kids, the best anyone could want; for my wonderful wife of almost 33 years; my grandchildren; for my USAF career anf my Justice career, and all the folks who helped make them great. I’m thankful for the friends I have somehow accumulated over the years, no easy task for someone like me! I’m thankful for my health. I’m thankful for my life . . . thank you, Lord. Lots to be thankful for, Dan. Thank you for sharing!